Due to the ever increasing demand worldwide to decrease our carbon foot print, and become as efficient as possible, JMT has developed a new series of press brakes, the EB Series all Electric Press Brakes. 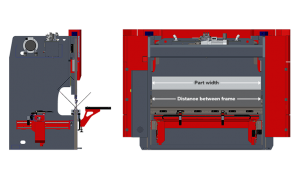 With the addition of these state of the art all electric press brakes for manufacturing, JMT will be firmly ensconced in the upper echelon of precision press brake suppliers worldwide. The new technology of all electric press brakes was created with one major goal in mind. The goal was to produce an all servo electric press brake which would reduce consumption of fossil fuels by at least 50%. 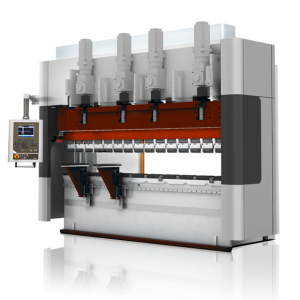 Currently we are able to offer these highly sophisticated Eco-friendly servo electric press brakes in 3 sizes. The EB 2512 with a 4-foot bending length, and 28 tons bending force. The EB 5020 has a 6 foot 10 inch bending width with 56 ton bending force. To round out the product line up is the EB 10030 with a 10 foot 1-inch maximum bending length and 112 tons of bending force. With some 60 years of experience in developing and producing highly complex metal working machines like press brakes shears and plate rolls, JMT USA is in a never ending quest to improve machinery capability as well as machinery quality. To that end, JMT USA has formed a partnership with a world class manufacturer of advanced “all electric” high speed press brakes. Our partner is a “certified manufacturer” who currently sells their machinery in nearly 40 different markets worldwide. We are pleased to be working together with a supplier who is considered to be one of the world leaders within this segment. Our partner has received several awards for innovation and advanced technologies in the design of their equipment. The Eco Bend 10030 is the largest machine of all of our electric press brakes. At a 10-foot maximum bending length and 112 tons of bending force it’s amazing to watch this servo driven press brake bend a considerable piece of sheet steel and not make a sound. The energy consumed to manufacture a part is on the order of less than 40% power consumption of a conventional press brake of equal size. Due to the “on demand” servo motor driven concept these brakes utilize, the electric motors turn on and off and run only while needed. The bigger all electric press brakes get, the more money is realized as savings. In addition to the main design intent to take the hydraulics out and all that goes with it, the second most important capability begins to become evident. Unlike many other press brake designs, JMT new EB 10030 all electric press brake can accomplish off center bending. They can do this because of their four independently operated servo motor drives which have motors now positioned closer to the press brakes center line. Another advantage of the all-electric press brake and it’s four servo motor concept is conical bending, which in the past required optional equipment on the old style hydraulic press brake. Multiple station bending is also enhanced, once again, because the servo drives for main ram movement are located much further inboard towards the brakes center line. Many benefits arise from this operational method. Since there is no hydraulic system within the new JMT Eco Bend servo driven electric press brake, none of the activities that are required to maintain a hydraulic oil system are required for these all electric press brakes, minimizing maintenance costs. In addition to reducing maintenance costs, the predictable down time for performing these maintenance chores is never realized increasing the machines available production window. 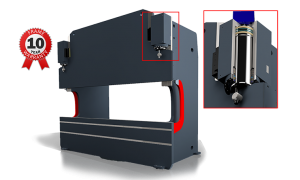 Because of the servo drives, the movement of the press brake is considerably faster in all directions when compared to conventional brakes, the result of that is increased productivity while maintaining + – .0004 accuracy and repeat-ability in all directions. Also the result of this extremely ridged design is the ability to hold as little as .001 degree of bending angle. Due to the “on demand” servo motor driven concept these brakes utilize, the electric motors turn on and off and run only while needed. Many benefits arise from this operational method. 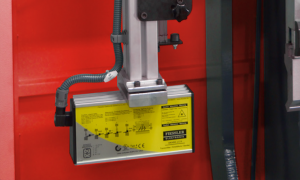 Since there is no hydraulic system within the new JMT servo electric press brake, none of the activities that are required to maintain a hydraulic oil system are required for these all electric press brakes, minimizing maintenance costs. Inherently good designs usually produce additional benefits and JMT “EB 10030” all electric press brake is no different. Because all movement of this all electric press brake is controlled by d.c. brush-less servo motor drives, the entire piece part cycle time is reduced by as much as 45%. Available options can literally customize these all new electric press brakes. Numerous automatic back gauges are available like the BG-1 and BG-3 as well as a custom tailored solutions that fit a customer’s specific application. The Eco Bend series comes standard with the AD-Control 10 numerical controller. This controller is quite capable for most everyday operations. If a more sophisticated controller is desired for the Eco Bend 10030 there are no less than five optional controllers available from the Delem 56 to the world renowned Cybelec 880S and Cybelec Modeva 15. When it comes to tooling up your new Eco Bend 10030 all electric press brake JMT has you more than covered. As factory authorized suppliers of both Wila and Wilson Tooling, we also provide JMT tooling developed over years of recommending and supplying our customers with tooling that has been proven in the field, that gets the job done, produced to our specifications. As you can see JMT rolls past the competition, because we can. We invite you to look more closely at our product offering, we invite you to look more closely at JMT and our more than 50 years of serving our customers. You want customer testimonials? How many hours do you have to spend?